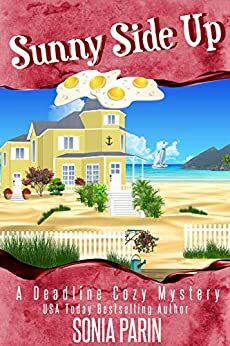 Sunny Side Up (A Deadline Cozy Mystery Book 1) - Kindle edition by Sonia Parin. Mystery, Thriller & Suspense Kindle eBooks @ Amazon.com. With her bitter divorce behind her, Eve Lloyd wants to relax and think about her next step. Paying her aunt, Mira Lloyd, a.k.a. Elizabeth Lloyd, renowned historical romance author, a long overdue visit, she plans to spend a month on Rock-Maine Island lounging around and plotting the launch of her new life. Her ex-husband, however, has other ideas. As for her aunt… she’s gone missing. And now there’s a dead body to contend with and a murder weapon with her fingerprints on it. A mantle of suspicion hangs over Eve and everyone she encounters has a reason to want her out of the way. Unwilling to leave matters in the hands of swoon worthy Detective Jack Bradford… only because it’s her civic duty to provide a new perspective, Eve Lloyd engages the assistance of her new friend and fellow suspect, Jill Saunders. They both stumble their way through a long list of possible motives and suspects in a race to find the killer before either one turns into the next victim. I&apos;ll never be a detective! A great start to a cozy mystery series. There is Eve, who on a surprise visit to her aunt arrives to find the house surround by police tape and her ex-husband dead on the kitchen floor. Then there is the neighbor who reluctantly helps Eve find up guilty party. And lastly Jack the good looking, single detective. 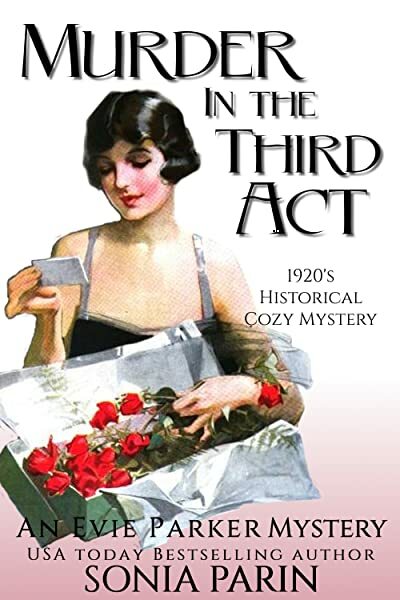 Sonia Parin writes Cozy Mysteries set in Rock-Maine Island, home to Eve Lloyd and her aunt Mira Lloyd, a.k.a. Elizabeth Lloyd, renown historical romance author... She also writes lighthearted contemporary romances - these follow the comings and goings of the men and women who call Eden home - a small country town nestled in the alpine/high country cattle region of Victoria, Australia. 2.0 out of 5 starsLots of grammatical errors. I read reviews before buying books and don't buy them when people mention poor grammar. No one mentioned it for this one, so I can only wonder what type of audience this book is reaching. Some examples of grammatical errors.... Her and Jill and went upstairs..... She sunk down into the cushion on the sofa....She had ran all the way to the house... etc. I may have changed the particulars, but the errors are what I found. It used to be that proof-readers read through a manuscript before the book was published, but I guess now anyone can write a book and publish it themselves. And if an actual company published this one, then shame on them! I felt like I was reading an essay written by a third grader. And I haven't even gotten into the repeated conversations people have, as if the author forgot she already wrote something and wrote it again. Unfortunately for me, this was the 2nd book in a row that I read on my KIndle with horrible grammar. I'm losing my interest in the Kindle if this is the kind of crap we can get. 1.0 out of 5 starsHad it been a book, i would have enjoyed. Its a novella that tries to get you to buy more. This would have been a cute book, had it not been so short. It came across as an attempt to lure the reader into the next books. This one is free but you are going to pay for the rest. Why not make it the size of a normal book and charge people. I would pay for a full book. I won't pay for chapter novels. It's a cheap ailuthor trick that we, the readers, are sick of seeing. 3 stars to Sonia Parin's Sunny Side Up, the first issue in her "Deadline" Cozy Mystery series. I stumbled upon this free e-book last fall and thought it might be a fun read. As I was cleaning up my Kindle Reader on my iPad today, I re-found it and decided to give it a chance, since it was under 100 pages. Cute read, a bit simple, but has potential as a series. Eve Lloyd sold her NY restaurant and divorced her useless ex-husband, rented out her apartment on a six-month lease and took a trip to visit her aunt. But when she arrived, her aunt was gone and the townsfolk found Eve quite strange. She comes back from dinner with her aunt's real estate agent and finds a dead body in her kitchen with a woman she'd only met the day before, claiming she just walked in on the dead body. As she tries to establish her own alibi, and prevent the townsfolk from thinking she's guilty, Eve finds a few new friends and develops a crush on the detective. She's captured by the perpetrator before the end and almost meets her own maker, but luckily the detective saves her. And Eve learns what her ex-husband did to try to save her. A cute, fun, simple read... nice intro to the cast of characters and the town. Easy for a light afternoon. Good beginning for a new series that shows promise. It needs depth. Dialogue was a little combative in the beginning. Wish I knew more about her parents and why she's so close to her aunt. Everything just sorta "comes together" as a setup for the series... just hoping it isn't always like that as it would be too simple. It's a light-and-quick read in between complex plots or an emotional roller-coaster of a read. Give it a chance but look at it as just a couple of hours of fun. I flew through this cozy mystery, I thought that the writing was polished and the dialogue fun! Eve comes to her Aunt Mira's beach house, after a difficult divorce, to figure out the next chapter in her life and for some relaxation. Little did she know that she would be embroiled in a murder and under the subject of scrutiny. I enjoyed all the characters and thought they were fun. I did struggle with whether to rate it a 4 or a 5. Here is why: it is easy to figure out the "who done it" so I was really just reading how the characters got to the same conclusion rather than trying to solve it with them. I can live with that, but some folks might be disappointed. The plot is not terribly clever. Also there were times that Eve and Jill would kind of rehash points about the clues, but I got over that too. Oh and the beginning was slow going for me. I decided on a 5 because there was great flow in the plot, there was an actual ending that I did not feel was rushed, AND the ending actually closed up the lingering aspects of the story so no plot holes. There were no obvious editing mistakes ( a huge problem with new kindle books lately). No lengthy descriptions about people, places or events, she let you use your imagination a bit. Attraction to the hunky detective was not lame or overdone. Last the author made me want to buy more of her books because I was interested in Eve's next adventure. I have not had a abundance of luck lately with free books and with this one had zero regrets so bumped it to 5 stars but for sure a solid 4 star. Thanks! 4.0 out of 5 starsMurder by Eggs? This was a n amazingly, funny, and different murder mystery. I thought it was going to be rather predictable from it's beginning, but, the author surprised me. A woman, divorced in a brutal court trial, leaves the scene of her failed marriage...well that was about the end of the predictable. You find yourself liking Eve Lloyd a lot. Eve speaks her mind, as we quickly find out when she arrives on the Rock-Maine Island, from her last home in Manhattan. Eve has an Aunt Mira who writes best selling historical romances. Mira has an 'open door' policy as far as her niece. So, when Eve arrives and finds her not home...questions arise. Not only that, Eve senses someone lurking outside at night. When she finds foot prints outside her living room window, then a break-in occurs...she calls the police right? Wrong...you see not predictable. Eve also goes out for some meals with the 'natives' of the Island and speaks her mind about her ex-husband. Words that may come back to haunt her. I won't say too much more and the story would be spoilt for you if I did. However, you may never eat your eggs sunny side up again...just saying! Enjoy this short book. I only wish it had been longer. Now, I will look for the next volume "Snuffed Out." Enjoy!